Scientists claim to have come up with a way to protect mobile phones and handheld computers, which is a thousand times more secure than text passwords. Researchers at Newcastle University say “graphical passwords” are a safer way to protect data than traditional passwords using words and numbers. Users draw a picture over a background such as a photo, and pen strokes are stored and remembered by the device. 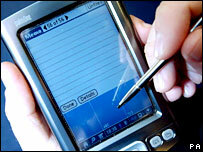 Experts claim images are harder than text passwords to copy by fraudsters. “Most of us have forgotten a PIN number or a password at least once, which is why we tend to make them so easy to guess. People who took part in a study had to choose their own background from a selection of five images – stars, map detail, playing card, crowd and flower. After creating their secret password images on the grid, they were asked to repeat what they had initially drawn. One week later, they were asked to re-create the same image, with 95% were able to do so within three attempts. Cute AND secure – very Apple!